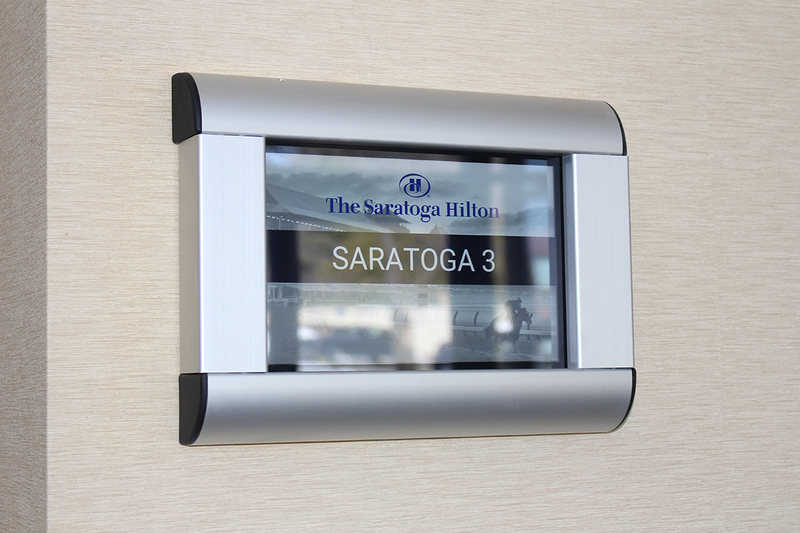 Room status, wayfinding and booking right at the door with digital room signs. Incorporate all of your room booking needs into one compact and sleek touch-screen device mounted right on the conference room door. Digital room signs allow you to manage conference room booking at your facility simply and conveniently using an already existing schedule. Our cloud-based software allows you to feed in live information directly from an already existing scheduling app such as Office 365, Crestron, Delphi or AMX. This way the information displayed on your digital room signs is the same information being viewed by employees, management and guests alike. 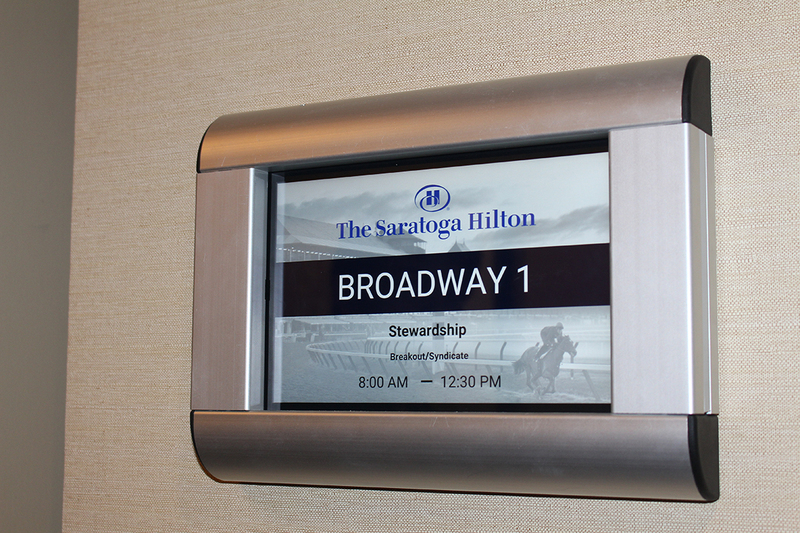 Room signs will automatically update when a meeting has ended, so no more outdated signage! Guest will always know they are looking at accurate and relevant information. 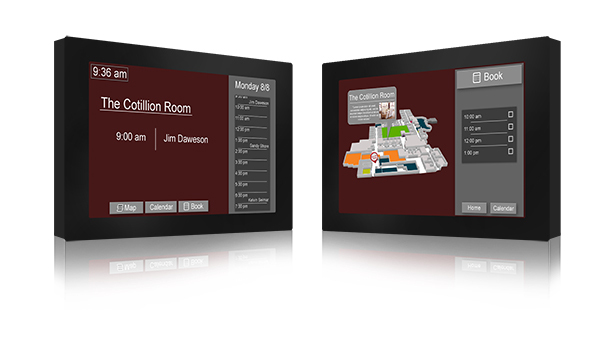 Digital room signs are built to increase efficiency and give your staff a break from managing multiple rooms. Guests can now check the availability of a room and even book a room using the digital room sign right at the door. Even push content right to the users phone to remind them they have the room booked on a certain date. This prevents “meeting room crashers” or interruptions during an important meeting. Digital room signs give your staff a break from micro-tasks that are involved with large facilities and allow them to do their jobs more effectively. Integrate your schedule and display room information on a dynamic 3D rendering of your facility. Perfect for large facilities with multiple rooms. Don’t inconvenience guests by making them walk to each room to check for availability- allow them to pick which room they are interested in right on the map! For more on interactive wayfinding click here. You know your audience best. With that in mind, Empire Digital Signs will put our team of graphics designers to work creating a branded user interface for your digital room signs. Add unique features and buttons that best fit your facility. Customize everything from the UI to the enclosure to your liking. For more on wooden enclosures click here. Not interested in digital room signs, but still room booking? Integrate the same room booking capabilities into an interactive kiosk for your lobby/high traffic area. 3D wayfinders are useful in their own right and adding room booking only enhances the guest experience. Click here for more information on interactive kiosks.